Chords are basically a number of tones in certain intervals stacked upon each other. The different intervals between the chord tones create different types of chords, which makes for different sounds and musical colors. If you use the notes of the major scale to create triads (three note chords) for each of the seven notes, you get seven chords, the so called diatonic chords of the major scale. Here are your first seven chords, which are also the easiest ones to learn on the piano. We use Roman numerals which are commonly used to describe scale degrees. As you can see, there are two different chord types on steps I to vi – major chords and minor chords, due to the different intervals between the notes of the scale (you will leave the diminished chord on degree VII aside for now). Note that the numerals for the major chords are written upper case and the ones for the minor chords lower case. Major chords or triads are built using the root (being the one, or first degree of the scale), the major third and the fifth. They are usually written as maj or just the upper case letter (in our example Cmaj or just C ). The major third is 4 half steps above the root and the fifth is another 3 half steps (the interval of a minor third) above that. Minor chords or triads contain the minor third of the scale instead of the major third, so you just move the middle note of the major chord one half step down. Minor chords are usually written as min or just m (in our example Cmin or just Cm). You can also see them written as C– or lower case c.
The intervals of the minor chord are opposite of those of the major chord. A major third is stacked upon a minor third. You can distinguish major and minor chords very easily by their respective sounds. Major sounds positive and pleasant. Minor sounds rather sad and deep. Both sounds are beautiful in their own ways. You don’t have to always count half steps to find your chords. 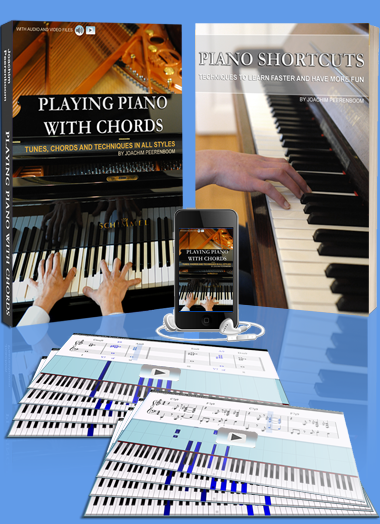 Use chord charts or simply listen to the sound of the chord you are playing. With time you will need nothing but your ear to know if you are placing your fingers right!